We’re calling it: the custom boxer movement has reached critical mass. 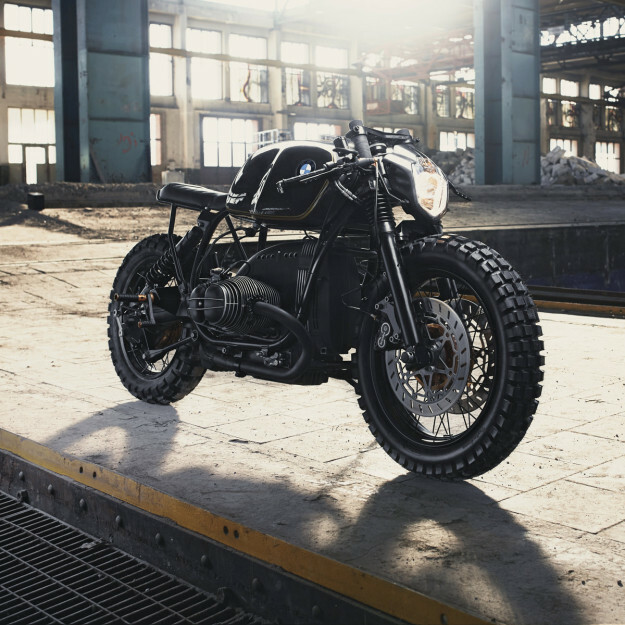 More BMWs are rolling off workbenches than ever before, so builders have to look at Bavaria’s sweetheart with fresh eyes to get noticed. 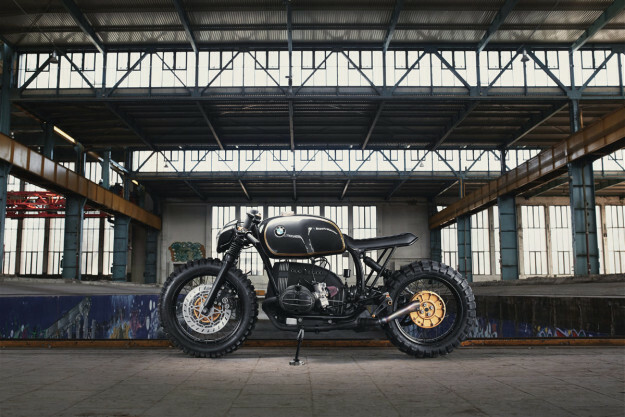 This neo-noir BMW R100R from Diamond Atelier is more of a swift kick to the jaw than a breath of fresh air. 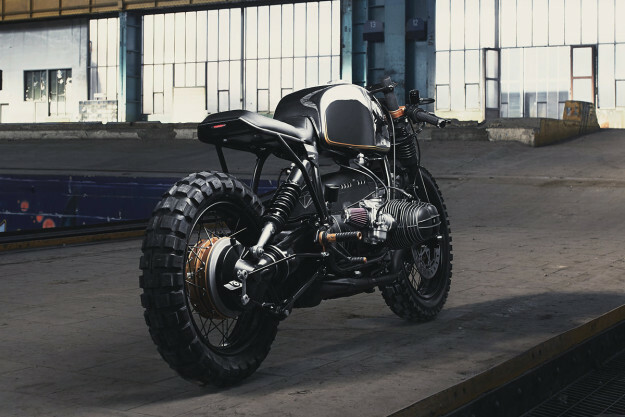 Astonishingly, it’s only the third build from the Munich-based shop—but it’s ganz wunderbar. 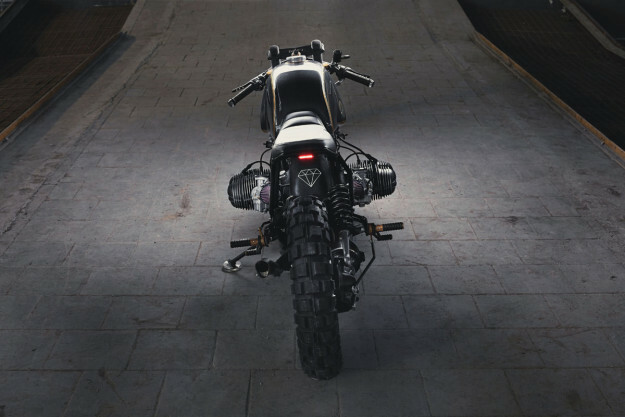 This time round, the duo wanted a donor with a bigger engine and better suspension, and managed to find a 1994 BMW R100R Classic. 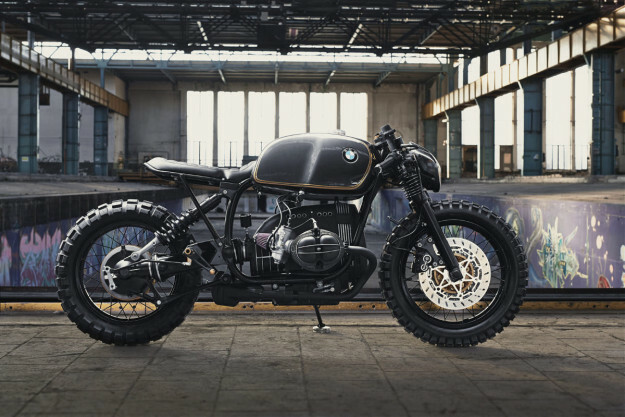 It’s basically a road-biased version of the contemporary R100GS. A more aggressive stance was in order; dropping the front suspension by three inches achieved the desired effect. The wheels have been stripped and re-finished: rims in black, and hubs in gold metal-flake. Tossing the R100R’s gawky stock tank and seat in the bin, Diamond Atelier fitted an older and more recognizable R-series tank—pitching it forward to match the bike’s new line. A new subframe and a hand-stitched leather seat follow through. 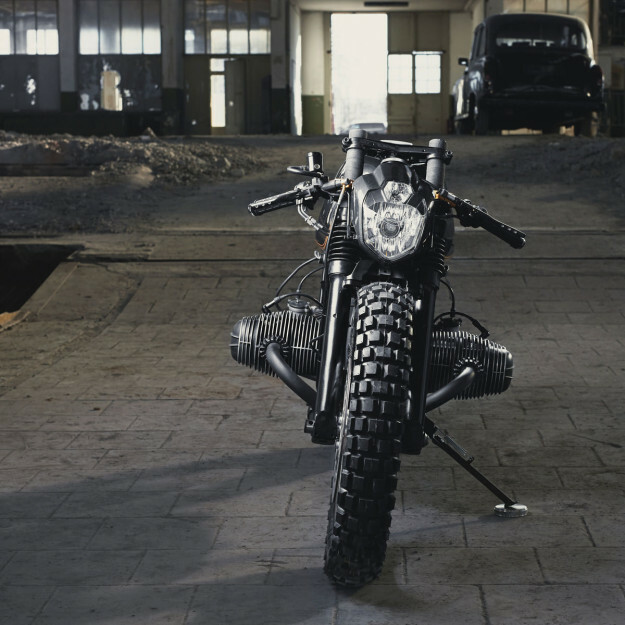 Up front, a perfectly aligned headlight from LSL adds a modern touch. (“And no, the headlight does not hit the front tire when riding through potholes,” says Tom.) There’s a small LED tail light poking out behind the seat. Motogadget supplied the turn signals: m-Blaze Disc bar-end units up front, with new m-Blaze Pins mounted on the foot peg brackets for the rear. The requisite clip-ons and rear-sets are modified aftermarket items—the former fitted with custom CNC-milled controls. 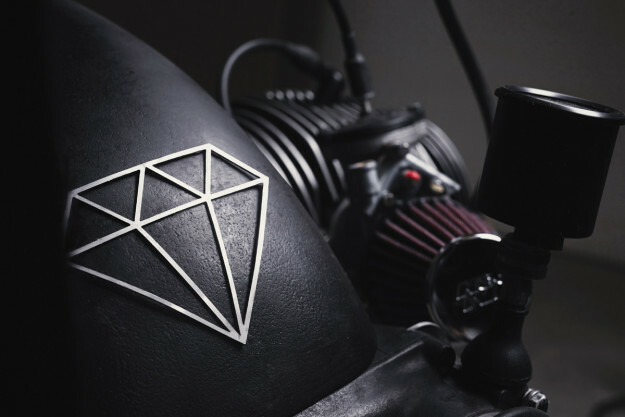 Diamond Atelier also re-worked the R100R top triple clamp, then added a plate cut with their logo and the bike’s number on top. Set into it is the crowning jewel of this build (quite literally): a 0.17-carat diamond. 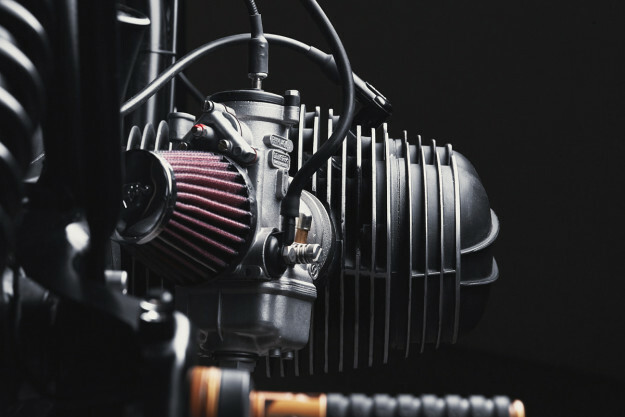 To wring as much power out of the engine as possible, Tom and Pablo have installed a pair of 40mm Dell’Orto carbs, K&N filters and an Akrapovic racing exhaust. Where the airbox once lived, they’ve fitted an elegant aluminum cover made by a German gentleman. “He’s produced many pieces for old airhead boxers and Guzzis, but they were discontinued. We think we may have bought the last one.” It’s now adorned with a diamond motif. Matching the upgrade in power is an improved braking system up front. That means a 320mm double floating brake disc kit, with Brembo calipers, a custom Brembo master cylinder, and braided stainless steel hoses. Diamond Atelier wanted the final product to be as uncluttered as possible. So, they cut the wiring right down to the basics, replacing the BMW’s car-sized battery with tiny Linergy battery packs, hidden under the tank. The speedo’s as hidden as can be: it’s been mounted directly to the gearbox. While it’s not the most practical position, it’s just visible enough to be considered legal. The finishes of DA#3 match its demeanor: dark and brooding. 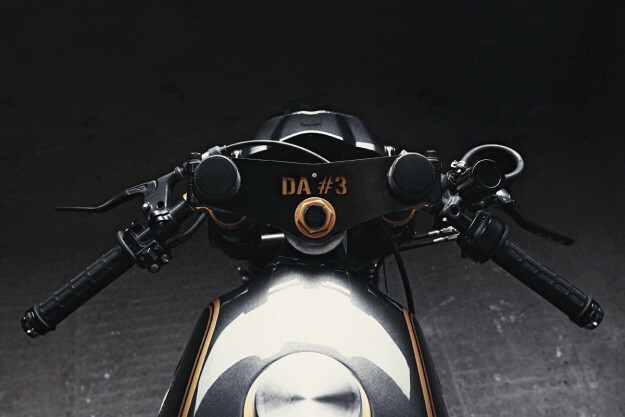 The tank is painted deep grey with gold pinstripes, and the rest of the bike is predominantly black—with tasteful gold highlights throughout. The effect works. “Every time we ride this bike around downtown Munich, people pull out their smartphones and start taking pictures whenever we stop,” says Tom. We’re not surprised—we can’t take our eyes off it, either. Diamond Atelier website | Instagram | Facebook page | Images © 2015 Philipp Wulk.